THE Municipal Government of La Castellana is upbeat that this year's edition of Bailes de Luces Festival will again boost the tourism industry of the southern Negros Occidental locality. Now on its 20th year, the festivity will be highlighted by the Bailes de Luces Festival Dance Competition on Saturday, January 5. Ten barangays merged into five competing groups as they vie for the title in barangay category, while two elementary schools compete for school category. Mayor Rhumyla Nicor-Manguilimutan said the festival has been drawing thousands of tourists every year especially during the highlight. Nicor-Manguilimutan said the influx of tourists is benefiting local businesses including small entrepreneurs. “We are banking on tourism, along with agriculture and other potential industries, to further develop the economy of La Castellana,” she said, adding that Bailes de Luces has put the town in the tourism map of the Philippines. Known as the “Festival of Lights,” Bailes de Luces is a celebration of thanksgiving. It has been compared to the Rio De Janeiro Carnival of Brazil. The dances and transitions of lights also symbolize hope for the people of La Castellana and a guide for the town in its aspiration for a better future, Nicor-Manguilimutan reiterated. She said that performances will also trace back the history of the festival, which was first popularized by using “sulo” or fire torch as the main source of lights. 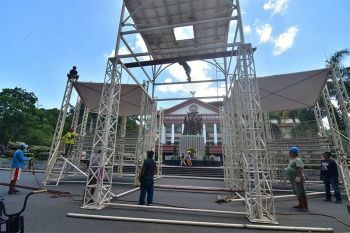 “Spectators could expect grander festival dance this year as we continue to innovate and extend support to the participants,” Nicor-Manguilimutan added. The local government provided P100,000 in financial assistance for every competing group in the barangay category, and P60,000 each for the school. In terms of prices, the champion will receive P100,000 in cash prize. First and second runners-up will receive P75,000 and P50,000, respectively. Non-winning groups get P10,000 in consolation prizes. Prior to the arena dance, the seven groups already competed in the street dance competition on December 30. For the first time, a group of 15 inmates at the town's Bureau of Jail Management and Penology will participate as a guest performer. Their performance will be recorded on Thursday, January 3, and will be shown during the arena dance competition. “We want them to feel that they are part of the celebration. This also forms part of our values formation initiatives for them,” the mayor said. Meanwhile, the municipal government has implemented about P500 million worth of infrastructure projects in 2018, during the town’s centennial year. 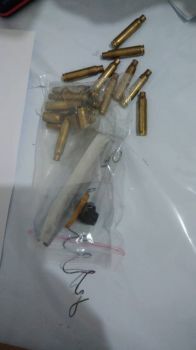 This was highlighted during the State of the Municipality Address (Soma) delivered by Nicor-Manguilimutan on December 30 simultaneous with the commemoration of the 122nd death anniversary of Dr. Jose Rizal held at the town’s auditorium. 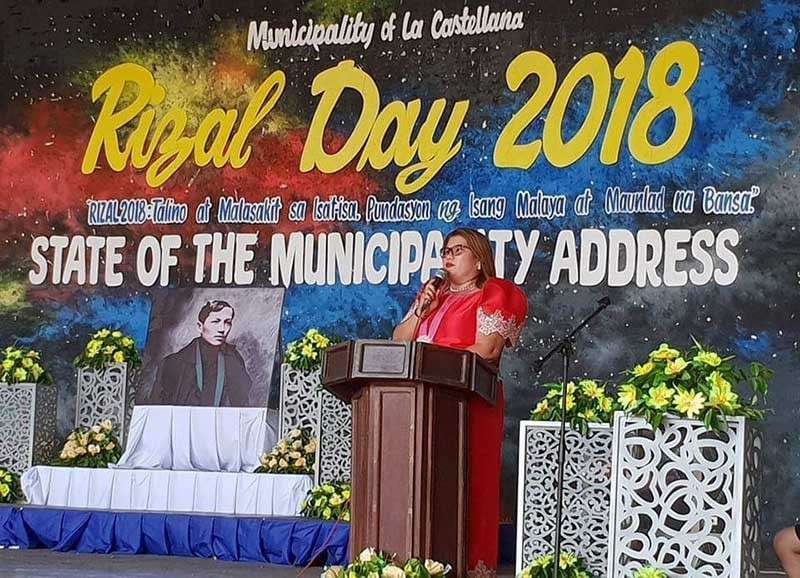 The town's first lady mayor said the infrastructure projects include the construction of school buildings, legislative buildings, and farm to market roads, among others. Aside from linkages with various national government agencies and Provincial Government of Negros Occidental, these projects were also funded by the municipal government from its Internal Revenue Allotment and collections. “Health, education and social services are also among the top priority of the local government,” Nicor-Manguilimutan noted. In her Soma, the mayor also underscored numerous awards and recognitions given to the local government unit (LGU) last year. These include the Most Child Friendly award from the Department of the Interior and Local Government, competitive LGU award in terms of economic dynamism from the Department of Trade and Industry, most improved LGU in terms of social pension implementation, and Most Outstanding Mayor award from Superbrands Marketing International, among others.